In 2014, this research was presented in a talk at the 32nd Salmonid Restoration Federation Conference. Preliminary results were previously presented on a poster in 2011 (picture at left). 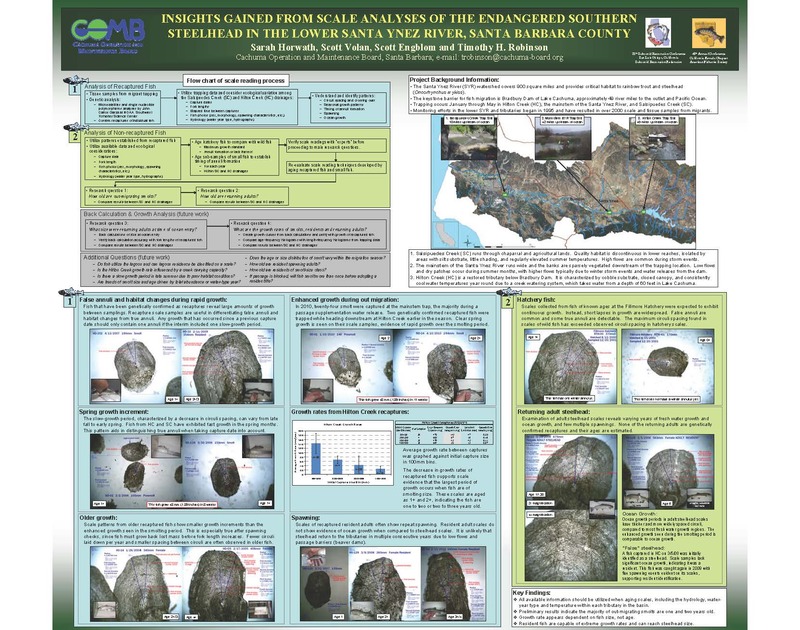 Scales of southern steelhead (Oncorhynchus mykiss) sampled from the lower Santa Ynez River (LSYR) watershed were aged to evaluate the life histories of fish in three hydrologically diverse streams: (1) the LSYR mainstem; (2) Salsipuedes Creek, a flashy tributary with intermittent lower reaches; and (3) Hilton Creek, a formerly ephemeral tributary which is now perennial due to a creek watering system which pulls water from the neighboring reservoir. Salsipuedes Creek confluences with the LSYR approximately 10 miles upstream of the Pacific Ocean and Hilton Creek confluences with the LSYR more than 45 miles upstream of the Pacific Ocean. 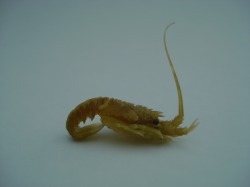 Temporal patterns in life history stages, ages, and sizes of sampled O. mykiss were investigated with comparisons to hydrologic and climatologic variables. Back-calculated sizes of adult steelhead at ocean entry were estimated using regression equations formed from scale radii and fork lengths of over 900 O. mykiss migrants. During migrant trapping, some fish were captured more than once, as confirmed with photographic analysis and genetic analysis of fin clips. 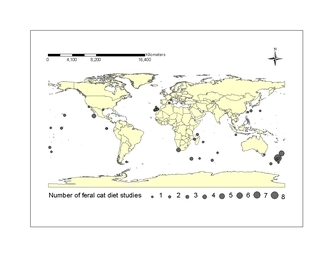 Back-calculation equations were validated with scale radii and fork lengths data from these recaptured fish. 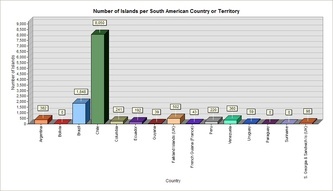 Islands are hotspots of biodiversity, harboring many endemic species. Introduced predators quickly disrupt fragile island ecosystems and devastate endemic species which are not evolved to cope with these pressures. Eradications of introduced predators effectively conserve endemism and restore ecosystem function. 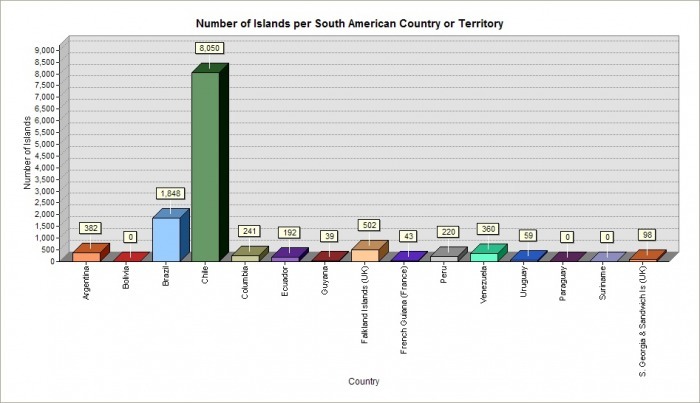 Island Conservation, a successful nonprofit that executes eradication projects to conserve island ecosystems, seeks to determine global locations for expansion of sister organizations. 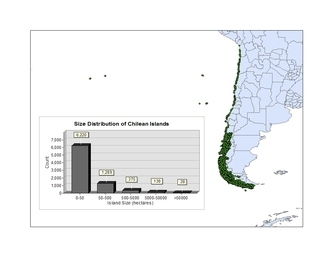 A geographic analysis of the world’s islands was performed using the ArcGIS (ESRI) suite of applications to calculate the number of islands and total island area by country. Ecoregions were joined to the world islands dataset and the output was used to model expected bird and plant diversity per island. 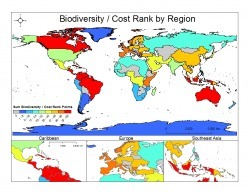 These geographic and biogeographic data were used along with socio-economic and climatologic data to rank countries to determine which countries are most suitable for establishing a nonprofit for island conservation work. 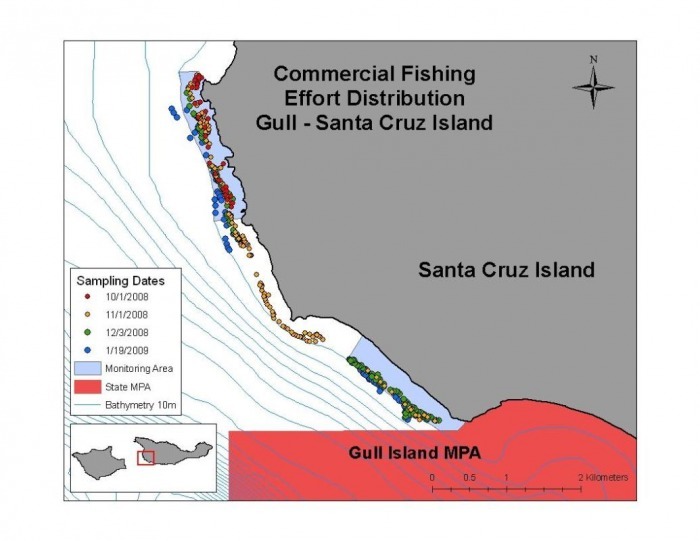 The results will guide the board of Island Conservation’s decisions as well as provide the conservation community with a global synthesis of predicted island biodiversity, geographic and economic data. The California spiny lobster (Panulirus interruptus) is a heavily targeted fishery species, thus there is concern over the sustainability of the stock. Recruitment of competent pueruli to near-shore substrate after a pelagic larval stage is thought to drive local population dynamics. Consequently, the ability to quantify recruitment fluxes has potential to improve fisheries management. 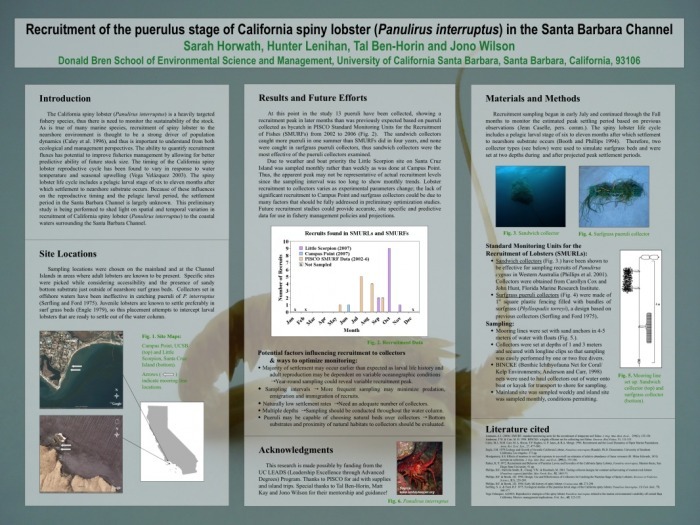 Expectations of this study included providing preliminary data to shed light on spatial and temporal variation in recruitment of Panulirus interruptus in the Santa Barbara Channel. Recruitment at Santa Cruz Island peaked in the middle of October, which did match the expected peak of July through August that was suggested by previous research and observations. The Campus point site only received one recruit, which was likely due to numerous factors which should be fully addressed in following recruitment studies. 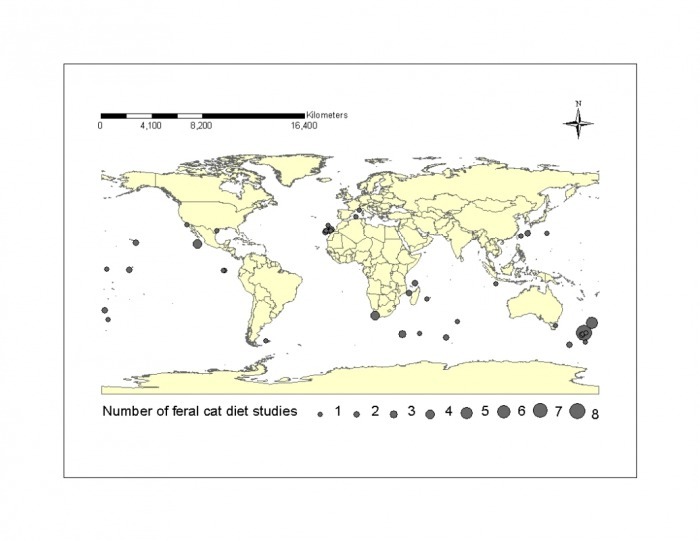 The diet of feral cats on islands: a review and a call for more studies. E. Bonnaud, F. M. Medina, E. Vidal, M. Nogales, B. Tershy, E. Zavaleta, C. J. Donlan, B. Keitt, M. Le Correand, S. V. Horwath. Biological Invasions. DOI 10.1007/s10530-010-9851-3. Barilotti, D. C., A. A. Barilotti, S. V. Horwath. 2010. 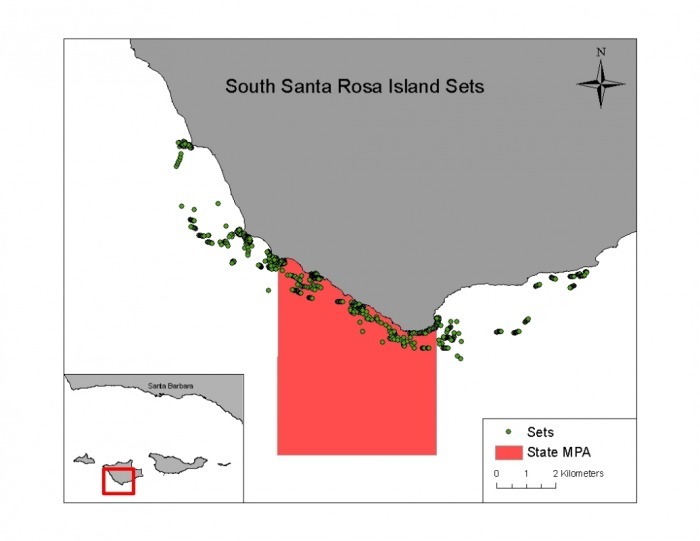 Essential Fish Habitat Report: Kelp Growing Study, Ellwood, Santa Barbara County. Bio Architecture Lab, Inc. In support of permit applications to the California Coastal Commission and U.S. Army Corps of Engineers.